Objects are represented as a collection of surfaces. 3D object representation is divided into two categories. Boundary Representations (B-reps) − It describes a 3D object as a set of surfaces that separates the object interior from the environment. Space–partitioning representations − It is used to describe interior properties, by partitioning the spatial region containing an object into a set of small, non-overlapping, contiguous solids (usually cubes). The most commonly used boundary representation for a 3D graphics object is a set of surface polygons that enclose the object interior. Many graphics system use this method. Set of polygons are stored for object description. This simplifies and speeds up the surface rendering and display of object since all surfaces can be described with linear equations. The polygon surfaces are common in design and solid-modeling applications, since their wireframe display can be done quickly to give general indication of surface structure. Then realistic scenes are produced by interpolating shading patterns across polygon surface to illuminate. In this method, the surface is specified by the set of vertex coordinates and associated attributes. As shown in the following figure, there are five vertices, from v1 to v5. Each vertex stores x, y, and z coordinate information which is represented in the table as v1: x1, y1, z1. The Edge table is used to store the edge information of polygon. 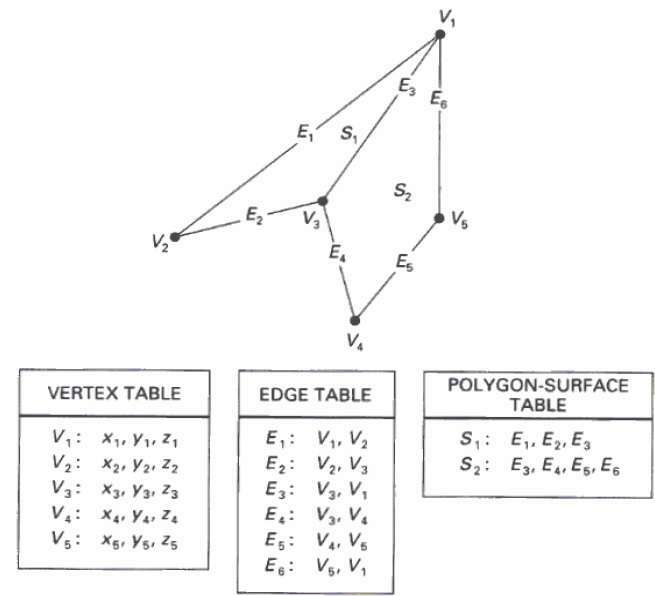 In the following figure, edge E1 lies between vertex v1 and v2 which is represented in the table as E1: v1, v2. Polygon surface table stores the number of surfaces present in the polygon. From the following figure, surface S1 is covered by edges E1, E2 and E3 which can be represented in the polygon surface table as S1: E1, E2, and E3. Where (x, y, z) is any point on the plane, and the coefficients A, B, C, and D are constants describing the spatial properties of the plane. We can obtain the values of A, B, C, and D by solving a set of three plane equations using the coordinate values for three non collinear points in the plane. Let us assume that three vertices of the plane are (x1, y1, z1), (x2, y2, z2) and (x3, y3, z3). Let us solve the following simultaneous equations for ratios A/D, B/D, and C/D. You get the values of A, B, C, and D.
To obtain the above equations in determinant form, apply Cramer’s rule to the above equations. Ax &plus; By &plus; Cz &plus; D ≠ 0 means the point is not on the plane. Ax &plus; By &plus; Cz &plus; D < 0 means the point is inside the surface. Ax &plus; By &plus; Cz &plus; D > 0 means the point is outside the surface. 3D surfaces and solids can be approximated by a set of polygonal and line elements. Such surfaces are called polygonal meshes. In polygon mesh, each edge is shared by at most two polygons. The set of polygons or faces, together form the “skin” of the object. It can be used to model almost any object. They are easy to represent as a collection of vertices. They are easy to transform. They are easy to draw on computer screen. Curved surfaces can only be approximately described. It is difficult to simulate some type of objects like hair or liquid.